The system is switched on by engaging reverse gear. This is accompanied by an audible signal. The system is switched off when you exit reverse gear. 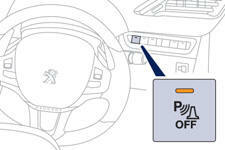 The proximity information is given by an intermittent audible signal, the frequency of which increases as the vehicle approaches the obstacle. The sound emitted by the speaker (right or left) indicates the side on which the obstacle is located. The function is deactivated by pressing this switch. The indicator lamp in the switch comes on. Pressing this switch again reactivates the function. The indicator lamp in the switch goes off.